What are games and points? We want our users to have more fun dealing with their everyday sales activities. That’s why we integrated game mechanics into TeamGram, to motivate the sales teams to participate and engage more. 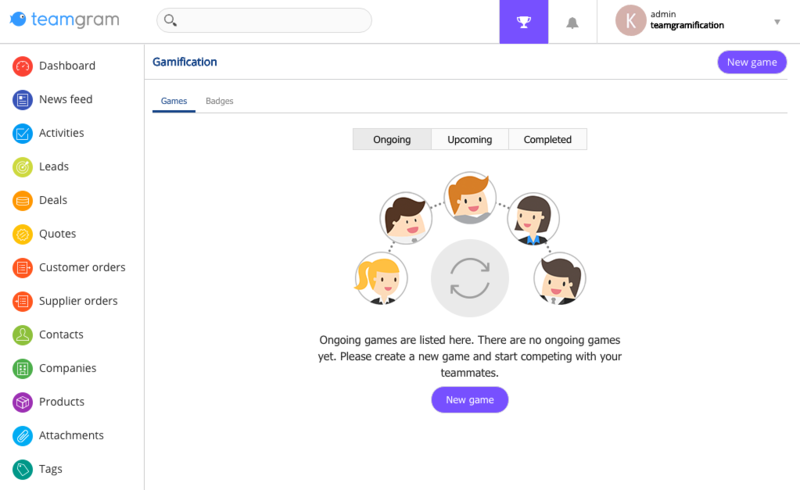 TeamGram Gamification offers individual challenges (badges) to encourage better performance and competitive challenges (games) to enhance collaboration and to drive more sales while having fun. A game is a friendly competition between participating TeamGram users. Points are used to determine the winner at the end of a game. Points in a game are earned by fulfilling predefined rules. The participant with the most points at the end of a game wins. How to create a new game? A badge is a reward presented when an individual TeamGram user accomplishes a certain goal in a specified duration. Badges are given to the users indefinitely once they are earned. Sales managers may set specific goals to encourage their sales reps to perform better and reward them individually with badges.